Having held my breath after a previous very poor experience, today it was unfortunately duplicated. Snail-tempo service to obtain a menu or be offered drinks, and even slower for them to be produced (with the beer a short measure!) and an order to be taken. It was finally almost an hour after arrival before seeing any food, which then was little better than tepid. Certainly didn't bother to stay and sample any desserts - now searching for a more acceptable alternative. From the outside this pub looked as though it would be quite rough and the staff and patrons perhaps a tad dishevelled. However on closer inspection it actually turned out to be quite a treat. As many others have pointed out it's more of a restaurant than a pub and I would agree that the food definitely takes priority over the drinks here. Despite this the beer is okay (as you'd expect in any restaurant really) and the food was very nice. What I liked the most though was the fact that it was so cheap. My friend and I visited on a Thursday lunch time and paid less than £30 for a three course meal and a pint each. It was bustling inside as well which is good news for the local community as it provides plenty of jobs for the younger generation. I will definitely be coming back here - I might even bring the trouble and strife! Unfortunately they ripped the soul out of this pub when they 'refurbished'/wrecked it a few years ago. 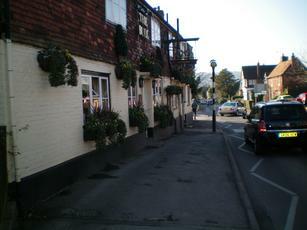 Prior to the alterations, it was a wonderful pub with real character and up to six different ales at a time. Now it's a dull corporate food re-heating utility with no enthusiasm for beer, staffed by people who have little interest in their jobs. Chef & Brewer seem to have a real vocation for turning everything to trash. Nice pub, good beer and excellent food but appallingly bad service! Everytime I have eaten here I have had to chase up where my food was! Tonight the first course arrived in reasonable time but the member of staff who brought it out (we were in the garden) ambled out with an "I-don't-really-want-to-do-this" attitude and toured the whole garden before he found us! We had already ordered dessert but half an hour after finishing the first course I had to go and chase it up! The same person ambled out with scalding hot crumble - fresh from the microwave - ignored the dirty crockery from our main course and ambled back to the pub empty-handed. He did this every time he brought some food out and by the time we left, several tables were loaded with dirty glasses and crocks all being ignored and the family on the next table were just about to chase up their food! aaac - it's not just at busy times you have to wait a little - I've had to wait a lot every time I've been there - and I've not been there at busy times!! Certainly wasn't busy tonight!